When you need professional, reliable direct mail services, look no further than Amos Communications. 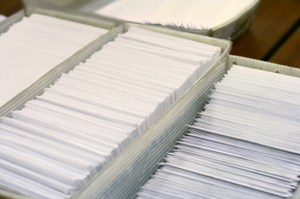 We have helped countless diverse businesses of Akron, Canton and Youngstown for years, handling every detail from direct mail printing to mailing services. Turn to our expertise for your next direct mail campaign, and we’ll show you why our clients consistently turn to us for their direct marketing needs. In-house mailing capabilities mean that customers have one resource for an entire project, from prepress through distribution. This shortens the overall time required since finished pieces can be prepared for mailing while the rest of the project is being finished. Projects do not have to be completed and shipped to simply sit and wait to be entered into the mail house’s production schedule. Often, several separate mail lists are combined in generating a universe of intended recipients. If the lists contain any duplicate names, the total list required for mailing may be less than the total quantity of names in the combined lists. If the lists are ready before projects are printed, we can ensure that only the quantity needed for mailing gets produced. The added cost is usually hidden since mail houses often discard extra printed pieces without notifying the customer. By presorting, CASS certifying and applying a barcode to each piece, we ensure that our customers receive the lowest possible direct mail postage rate and lowest total project cost.